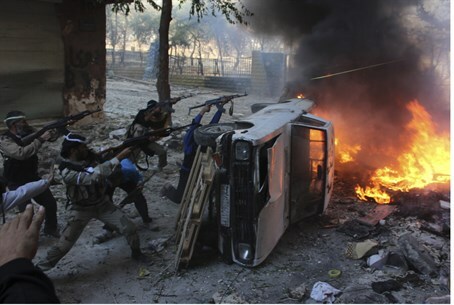 Jihadist rebels assault the regime-controlled central prison in the main northern Syrian city of Aleppo. Syrian rebels assaulted the regime-controlled central prison in the main northern city of Aleppo on Wednesday, the Syrian Observatory for Human Rights told AFP. The mostly jihadist fighters launched an attack on the administration block of the prison, which has been under siege for months. Observatory director Rami Abdel Rahman said the assault, the first since the siege began, was carried out primarily by rebels from the Al-Qaeda affiliated Al-Nusra Front and from another Islamist faction, Ahrar Al-Sham. "Fighting is going on inside the building," he said, adding that it "has not reached buildings housing prisoners." Abdel Rahman said government aircraft were carrying out strikes on rebel positions outside the prison, located on the northern outskirts of the city. Since July last year, Aleppo’s east district has been held by the rebels, and the west has been held by forces loyal to Assad. The 13-member Islamic Front for the Liberation of Syria, which split off from the Syrian National Council opposition force, declared Aleppo to be an independent Islamist state months ago. Members of Al-Nusra and other Syrian rebels groups have committed atrocities during the Syrian civil war, including publicly beheading a Catholic priest who was accused of collaborating with Bashar Al-Assad’s regime. Some of the Islamist groups have attempted to soften their image in an attempt to win hearts and minds - holding stand up comedy shows and handing out toys to local children. There have also been numerous clashes between Arab rebel groups and Kurdish militias in the north of the country.